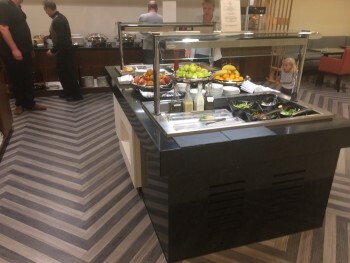 This is my review of the Singapore Airlines business class lounge at London Heathrow Terminal 2. 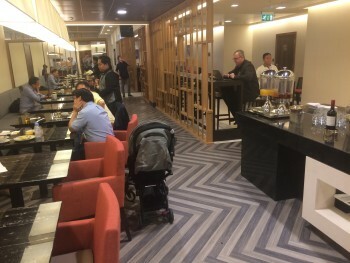 A couple of weeks ago I reviewed the Singapore Airlines First Class lounge at Heathrow. This was a private visit conducted when the lounge was empty. 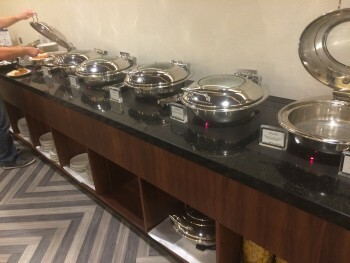 I was keen to take a look at the adjacent Singapore Airlines Business Class lounge. Two weeks I got my chance as we headed down to Singapore on holiday. I was not hugely impressed. The space is simply not big enough to handle the number of business class (and Star Alliance Gold) passengers who pass through each evening when there are two departures very close together. By the end, every seat in the room was taken. The seating is also very dense and the room began to feel claustrophobic. The biggest joke was the magazine selection. 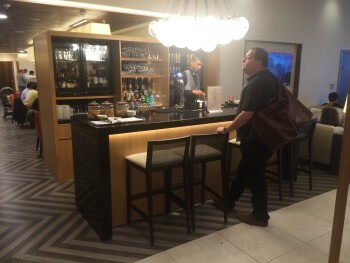 It looked like a US airport lounge, with a selection of magazines driven by who was willing to pay be included rather than by what the passenger actually wants to read. I can think of no other explanation for the large pile of ‘What Pool and Hot Tub?’ magazines on display. The one thing I did appreciate, although it is not pictured, was a small kids play area with a selection of chunky Lego and a playmat. Luckily it kept my two entertained. As a special treat, as it was their first overnight flight, we had allowed them to travel to the airport (by taxi and Heathrow Express) in their pyjamas! In a couple of days I will show you the Boeing 777-300ER business class seating. This is actually more modern than the seating I saw on the Singapore Airlines A380 the previous week and, as you will see, a lot more attractive. REMINDER: Don't lose your £10 Amazon Amex cashback! Ends tomorrow. I’m surprised you didn’t go all the way to the airport by Uber considering the excellent rates, or was Heathrow Express more because the kids love trains? If time is tight I prefer the train as it’s easier to know your arrival time (getting held up on the tracks is rarer than getting held up on the road) but when I have more time I much prefer to be dropped by car directly outside departures. The HEX is also badly positioned for T2. We were leaving the house at 5pm on a Friday at the start of a Bank Holiday weekend. I didn’t fancy my chances of making swift progress down the M4. It is the first time in literally years I have used the HEx though. I love it how going to the airport in your pyjamas is considered a special treat by kids! Some of the kids pyjamas, these days, are great! I used the lounge a month or so ago, not long after it opened. I liked the furnishing choices, but as you describe, it feels too small. I think the L shape doesnt help – makes it feel like everything is up and down the one corridor everyone else is trying to get along. 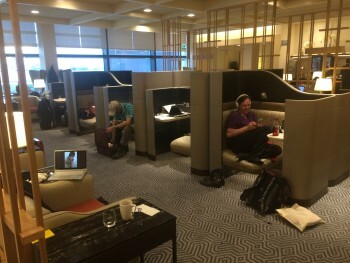 I was disapointed – the previous T3 lounge had a nice cosy feel to it which seems to have been lost. I assume the Air Canada lounge (entrance opposite the SQ lounge) has similar issues as it too has to fit within the tightness of the building (half the size of the actual structure as the other half is given over to the arriving passenger walkway and atrium). I’ve suggested to my wife that she (we?) should also travel in our pyjamas, but on Southern we can’t afford to be thrown off. There is a photo on the Instagram page of my kids on the HEx in PJ’s! 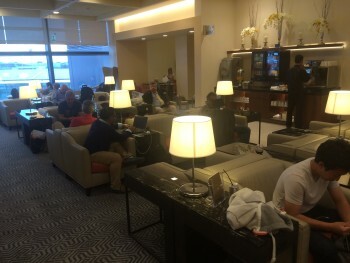 Better than T5 Galleries Club though..? Depends what you want! Better booze in GC, meter mags, far more spacious. Singapore is obviously newer and the food is better. Loads of Economist at No 1 Traveller in Gatwick today! Also visited the new MyLounge, review to come.